Technology-based investments have an attribute in that they create operating leverage. When applied correctly, software can support exponential growth in sales/revenue with no/low increase in cost. 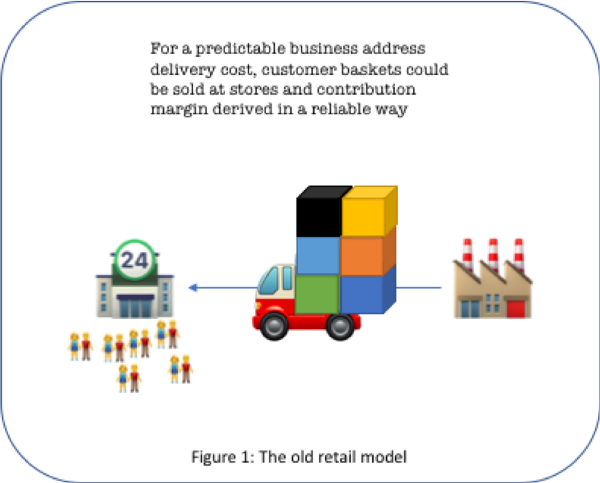 Last mile delivery does not scale like software. Last mile delivery costs increase corresponding to the increase in deliveries. In addition, in my last article “Amazon Stresses Logistics at Every Mile”, I also postulate that the cost components are supply constrained so their unit costs will actually increase even faster than the historical norm. This means that the contribution margin of each delivered package becomes progressively worse, dinging profitability, even as sales continue to increase. Consider an eCommerce operation. The technology platform has great operating leverage in that once the investment is substantially made in technology to enable the business, only marginal ongoing investments maintain the business and keep it competitive even as utilization/sales scale exponentially. One time Capex (as long as we are doing substantially the same thing), creates balance sheet value and then as sales increase, computing resources are added as needed. However, the unit cost of computing resources is constantly going down. Therefore every scale unit is cheaper than the prior, per Moore’s law. In the interest of transparency, I am oversimplifying here to show the contrast with the delivery operation knowing full well that most technology teams are constantly building new feature sets to improve the customer experience and operational reliability. In our work over the last 12 months with many online sellers, we found a significant proportion investing in upgrading their technology platforms. 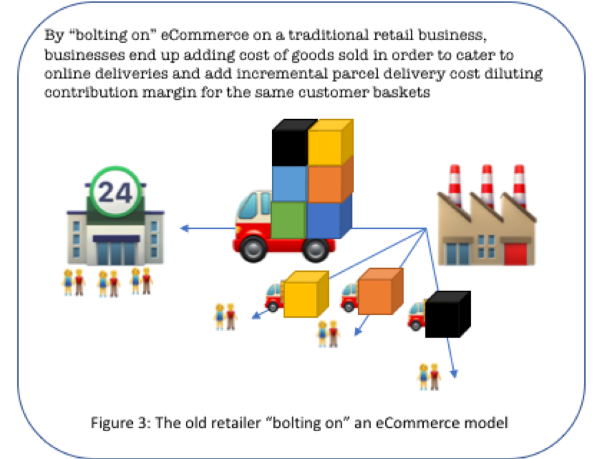 At the same time, eCommerce operations demand very flexible and responsive supply chains. Whereas the core capacity (warehouse, systems et al) are an upfront Capex unit (or are outsourced), unit costs to expand and bolster piece parts constantly increase relative to the prior baseline. This is because space, transportation, and labor are all constrained; driving up unit cost. In addition, as more and more deliveries are being redirected towards residential addresses, relative to the aggregation of those very same items within retail locations; the operating cost is increasing substantially. In the last year, we found most online sellers have not been investing in any last mile consumer satisfaction or cost improvement efforts. Curiously, most are investing (again) in the eCommerce features (Browse, Search, Merchandising, Marketing). The same area where they have been investing for the last 20 years!! Let’s use a simple pictorial to show how traditional retail businesses take on dilution risk when they bolt on an eCommerce business. First, a traditional retail model. Here, using comp data and central forecasting technology, retailers have historically predicted what needs to be sent to the store using reliable road transport at a predictable contribution margin as long as they were good “operators”. Worked in every instance of a great retail growth story. For some eighty odd years. Then as eCommerce grew, the delivery and fulfillment options started getting more complex. Most businesses (led by Amazon) needed to deliver packages within 2 days and as long as a minimum threshold was hit, shipping became free for consumers. Then came Amazon Prime, Amazon Fulfillment, Sunday delivery using USPS and USPS became a delivery subcontractor to UPS and FedEx. And for a while, it was enough. However with increasing scale of delivery volume, the profitability of delivery kept declining. This is evident in the SEC filings for UPS, Fedex, and even Amazon. There is also this from the USPS recently. The delivery satisfaction has hit a high water mark and is now declining because of theft, redelivery, expectations from consumers on how, where and, when they want their packages. With the growth of eCommerce, traditional retailers bolted on eCommerce “businesses” as a brand new P&L. 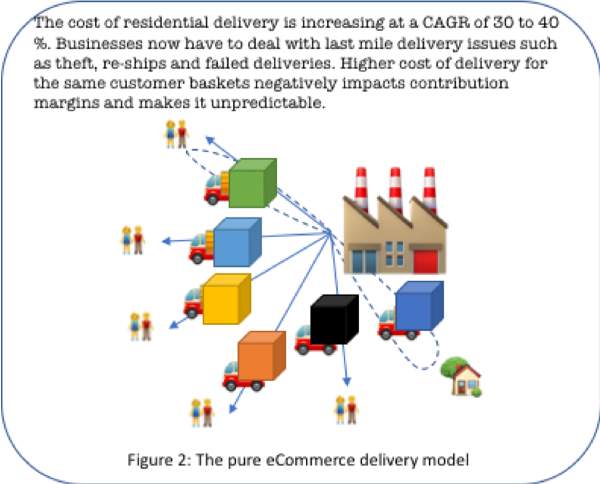 However, because in many cases the supply chains were (and mostly are) unintegrated, they ended up diluting the business not only through increased COGs but also through added shipping cost for the same set of customer baskets. Clearly the worst of both worlds. However, what choice do they have? After pooh-poohing the internet phenomenon first and then Amazon forever; this was the fastest way to get a digital business off the ground. Since markets were demanding progress on digital models, traditional retailers were forced to prioritize speed to ensure market capitalization; optimization could come later. Despite all of that and in spite of everything that everyone is doing right now, Amazon is headed towards owning more than 10% of all sales and most of the eCommerce activity. Also notice the rapidly growing store based contribution to Amazon’s income statement, it went from $1.2 Bn in q3 2017 to a whopping $4.2 Bn in Q1 2018. A 3X increase. Traditional retail needs to think about Omnichannel retailing version 2.0 like their life depends on it, because it does. It cant be about blindly investing to check off boxes on the various flavors of omnichannel retailing (refer to my prior article on this topic — “The fallacy of embracing Omnichannel dogma for physical retail.”), as most have and are curretly focussed on without contemplating mid to long-term contribution margin. We strongly recommend a profitability, audience and, loyalty led paradigm that activates the convenience of online shopping and marries it with elegant in-store experiences. We need to solve for last mile friction, build in-store sales and, significantly enhance loyalty. That doesn’t mean that ship to stores is the only thing retailers do, not at all. In fact, we suggest a unified experience that makes the interaction between the consumer and the retailer extremely easy by offering many options from which consumers can choose whatever fits their needs in a way that improves contribution margin. For the location operator, this starts adding top line sales in store on a median basis on the back of growth in eCommerce thus enhancing gross margin. We @Packyge intend to use machine learning to build these in-store baskets. At the same time, ship-to-store improves contribution margin for the online seller by reducing the median per parcel cost of shipping when users choose this shipping option. Most importantly, its consumer-led and when sellers let consumers choose amongst useful options (as Amazon has now irrefutably shown), consumers convert better and become more sticky. @Packyge is now a year old and we are beginning to land our first contracts. We have grown our location network to almost a 1000 locations from a big fat 0 in August! Come join our network or subscribe to our cloud tech for your own use as a white label.